For me a good trip (whether for business or pleasure) should be satisfying and include delicious food, comfortable accommodation and unforgettable activities. 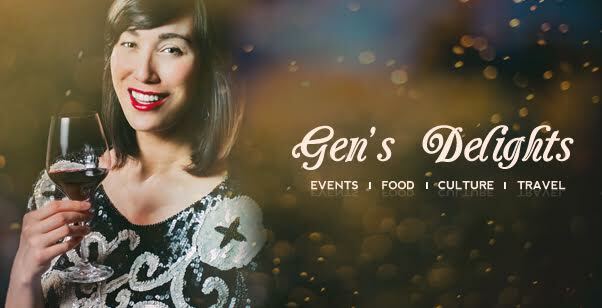 “Gen's Delights” invites you to join me as I embark on a journey of discovery around Montreal and its surrounding regions. Through this blog, I wish to share my favorite “Coup de Coeur” food and travel destinations with community members as well as offer tips and advice for the savvy traveler. Bon voyage! I was selected as an Activator for the Rideau Hall Foundation: 40 curated individuals , all experts in their field and from all corners of Canada who collaborated over 48 hours to create the blueprint of what will be the greatest 150 anniversary present for all Canadians: A foundation for all. From May 27th to the 29th, Montreal hosted ﻿C2-MTL﻿ at l’Arsenal, right in the heart of one of Montreal’s fastest growing commercial and residential districts; Griffintown. Now in its third year, C2-Mtl has gained worldwide recognition as being a top tier international business conference on commerce and creativity (www.c2mtl.com). Curated by design, communications and advertizing agency SID LEE and supported by Founding Partner Cirque du Soleil, Content Partner Fast Company magazine, and Leadership Partner Microsoft, this annual gathering helps to build connecting bridges between the 4000 + participants over three activity and workshop filled days. 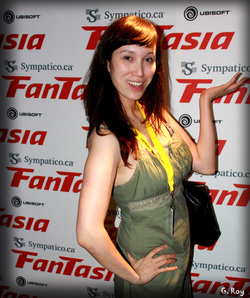 Covering the 2013 edition of the Fantasia Film Festival : Montreal's most outstanding and largest genre film festival in North America. From day one Fantasia film Festival started with a bang with a cast of impressive volunteers, programmers and lines of loyal fans !!! I have been attending this unique festival almost since it's inaugural year in 1996. One of the most charming things that I absolutely love about the festival is the general openness and convivial atmosphere from all its participants. Guests and directors are willing and encouraged to mingle with attendees before and after screenings and it is not unusual for parties to continue until the wee hours of the morning at various local pubs. During screenings don't be surprised to hear cheers or loud applause when an actor/actrice accomplishes glorious feats of bravery on screen. Among the many North American premieres that the Festival have helped launch are included Ringu, Inglourious Basterds, Thirst, We Are What We Are, Visitor Q and Night Watch. For it's 2014 edition running ( July 17th to August 5th ) Director Abel Ferrara will introduce his film : Welcome to New York "starring Gerard Depardieu " as the closing film of the festival !!! Did you know we would have a huge starvation issue on our hands without bees and their significant role in fruit and vegetable production? For their 135th anniversary, Birks is supporting the honey bee preservation through the launch of three special bee themed collections. From Tuesday, May 27th Birks will unveil these exclusive collections as well as an urban beekeeping installation and suspended green roof at its flagship Square Phillips location in Montreal with the support of Alveole, a local group who promotes urban beekeeping and Topia, an award-winning landscape design firm. 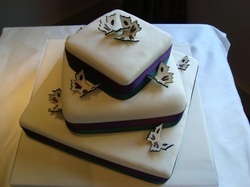 An elegant client and press only garden-themed party will officially launch the new collection. 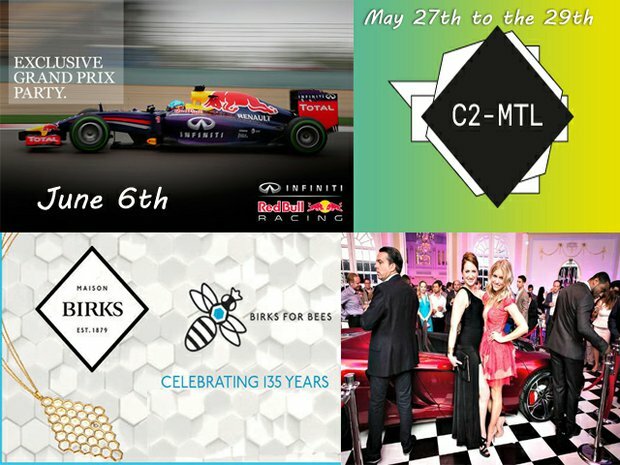 RITZ CARLTON Montreal and INFINITY Canada celebrates the Grand Prix Weekend ! 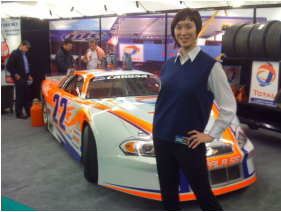 GRAND PRIX weekend with the Jet Set in MONTREAL 2014! From June 5th to the 8th, it's not just about the race. It's about a whole city coming alive with excitement! People arrive in Montreal from every part of the globe with one common objective - to get the most out of their 72 hours! During Grand Prix Week, whether it is to see the actual races on the Gilles Villeneuve circuit or to visit one of the official merchandise stores, themed restaurants or festive clubs. The atmosphere is at a festive peak with opening hours stretched out for most of the evening and into the wee hours of the night ! For tourists or locals planning to spend the F1 Grand Prix week in Montreal, GrandPrixMontreal.com is an excellent site to catch up on running activities as well as to purchase race tickets! Wearing a Litograph T-shirt of the Great Gatsby. Litograph is an innovative print company that takes the process of owning and living a piece of the adventure one step further; Litographs are prints that are created from the text of classic books. The company has gained recognition for printing almost entire novels on beautiful black & white and colored posters offered in two sizes for your home or office. There's just something special about having such a tangible connection with a book. Amarula ice restaurant in Centropolis Laval. The second of it's kind in North America entirely made of ice. Winter and gastronomic lovers are in for a treat this year as the promoters of Snow village and the Auberge Saint-Gabriel have partnered up to present the opening of the Amarula Ice Restaurant . North Shore residents can easily access and enjoy this unique dining experience, the second if its kind in Montreal, conveniently located on Avenue Pierre Peladeau in the heart of Laval’s Centropolis. Cheryl Besner and Violinist Dr. Draw. Québec writer Bryan Perro joins forces with the OSM and Maestro Kent Nagano in a dreamlike and surprising musical tale. With joyful enthusiasm and light humor, he took the entire audience on a journey to the past as he plunged us all into the world of two rival villages from an area surrounding the Saint-Maurice River, caught in the middle of an epic battle of intense rivalry. We create all sorts of videos : Corporate, Music videos, Live action and Artistic Shorts. Members include : King, Genevieve, Thierry and Ari. = Fantastic Reality ! Please come and support us at Cinema du Parc on the 28 th of June at 9 pm ! MARY of the High Seas Crew !! In July 2011, I joined this amazing crew from the musical production Mary of the High Seas. 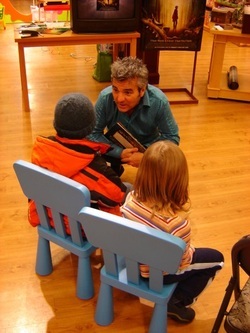 I lent my musical talent as a violinist to the three reading performances they held in Edinburgh. Now I am their new Asia Projects Coordinator to bring MARY to Asia in 2012 !!! 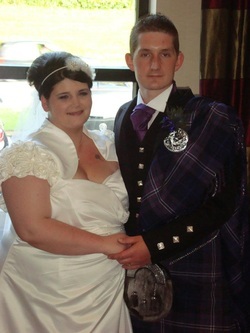 3 out of 5 are true Scotsmen....I wonder which ones ? I joined their competitive Dragon boat racing team for 2 consecutive years ! I was initiated to tango in Singapore five years ago in exchange for violin lessons.... Since then I haven't stopped !!! It is soo addictive, I just LOVE it ! 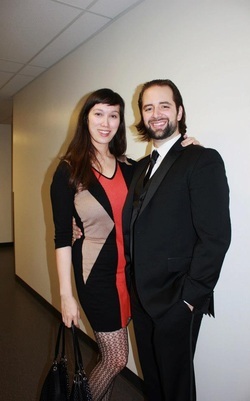 I personally love my native Montreal tango society , however I found a tango family here in Edinburgh as well as making several good and lasting friends in the societies of Prague and Singapore ! My friend Juan 's first short film "FIRST TIME" is online!!! I appear at the 8:04 mark ! GUY or GIRL...tango is all about the walk and the connection you feel with your partner. 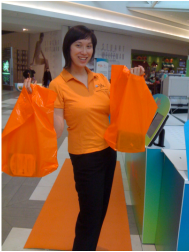 Let's meet, greet and get creative ! I helped to develop and hold an art event at Edinburgh Uni dorms for the new students along with dorm coordinator Jeremy Murray 2010. 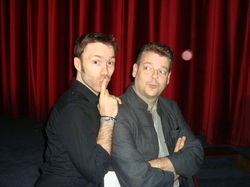 However , you do know you will meet great ppl such as Jonathan Clements at the Edinburgh Anime Fest !!! Working as a Sales Promoter and Volunteer at the Ottawa Animation Festival provides opportunities to meet talented filmmakers like Joanna Quinn! Halloween is always more fun when you are spontaneous and creative ! I got 30 members of the Concordia University animation department to dress up and ride the entire Montreal metro line for one night of awesome partying ! Being dead isn't easy...but it is fun !!! 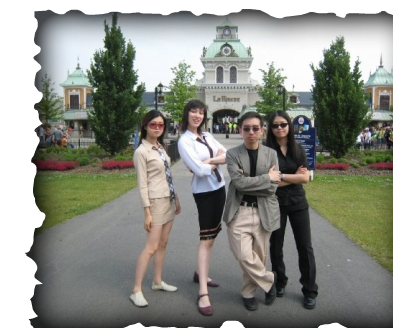 I used to work as an interpreter guide for 2 1/2 years at the EXPORAIL train museum in Mtl. YAZ...what is YAZ...sorry can't tell you ! Promoting YAZ with GOBees !!! at Palais des Congres Mtl. 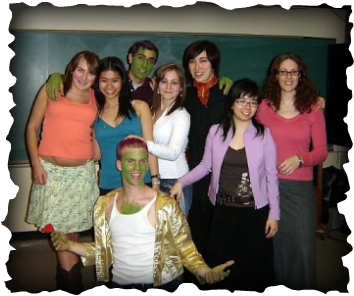 At Mcgill University, during my Terrestrial planets course, we were given the option to either write a 2000 word essay or do something creative...So 8 of us decided to put on a play! Turned out to be a lot more work than an essay, but 1000 times more fun ! I acted as the narrator /God and also played the violin in this production. 'Gone with the Wind' type romantic drama with my mom Mrs. Quee Ying Wong at the Farah Foundation Clothing event . 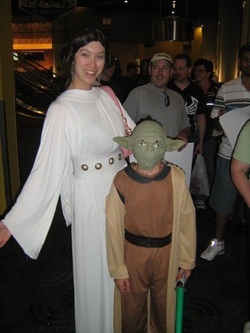 What could be better than dressing up as Princess Leia to promote the animated version of a grand classic ? ..............dressing up as Yoda !!! 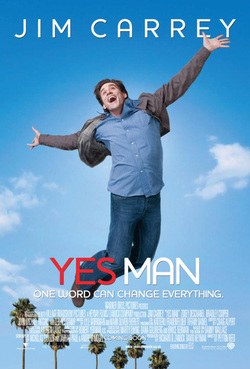 Say Yes to Yes Man !! For the Jim Carrey’s film YES MAN- I invited known motivational guest speaker Pierre Morency to give a speech at one of the promotional screenings where I also had members of the Crush Citron group to hand out samples to the audience. Oh what a NIGHT it was....promo parties at Montreal's very hip 737 night club with my favorite Bat girl, miss Janet Nguyen and Brian !!! BATMAN - THE DARK KNIGHT. 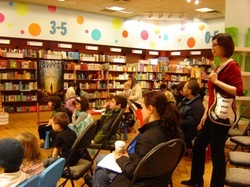 I began inviting people through Soundbeat Radio, le Cinema.ca, Ioncinema.com and Cinoche.com to pre-screenings of the film shortly before it opened nationally in order to build up awareness and create buzz. Promoting Stardust was quite magical with the entire team from LUSH cosmetics present to treat all lovely ladies to a spa day ! Oooh it pays to be a Paramount Pictures studio rep! Got to meet and greet Mr Benjamin Button himself at the old port of Montreal. Thanks Chris B. For getting me that first job with Paramount ! 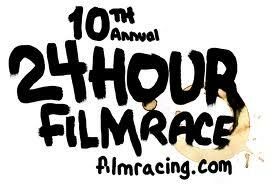 THE BEST FILM FESTIVAL OUT THERE ! In August 2008, I got to meet and befriend Kung Fu Legend Mr Gordon Liu aka : Master Pai Mai from KILL BILL in person . Such a friendly and talented actor !